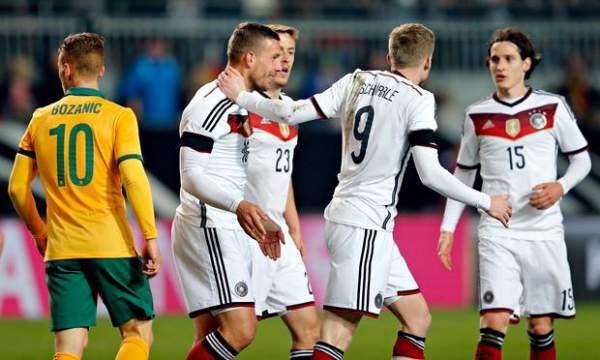 Live Streaming of Australia vs Germany is available. You can watch today’s game of Group B in the FIFA Confederations Cup 2017 online as AUS plays GER at the Fisht Olympic Stadium. Chile and Cameroon are the other two teams in group B, they have already played their first game which resulted in a Chile win by 0-2. Press X to close the AD to watch the live video. 20th June 2017 at 20:30 (IST). Fisht Olympic Stadium, Sochi, Russia. Australia are currently 48th on the FIFA rankings and they are playing against Germany one of the best teams in the World. They would need to be at their best if they want to even compete with a team like Germany who are the 2014 FIFA World Cup winners. Australia are in Group B of the World Cup 2018 qualifiers Asia and are currently third on the table with 14 points from eight games. They have won four games and drawn four. They played against Saudi Arabia in their previous game in the World Cup qualifier and won the game by 3-2. Tomi Juric scored twice and Tomas Rogic scored for the Aussies. Germany are the second placed team in the FIFA rankings and also the reigning world Cup winners. They will start their title defense in Russia next year. Right now they should focus on finding the best XI that will play the most number of games in the World Cup next year. They are top of the table in their World Cup qualifying group which contains Northern Ireland, Czech Republic, and Azerbaijan. They have won all their six games and have 16 points on the table. They played against San Marino in their previous game of the qualifiers and thrashed them by 7-0. Ryan, Degenek, McGowan, Sainsbury, Mooy, Jedinak, Irvine, Rogic, Smith, Leckie, Juric. Ter Stegen, Kimmich, Mustafi, Hector, Can, Brandt, Goretzka, Draxler, Younes, Stindl, Wagner. Germany is a very strong team and are in great form and can win this very easily. Who do you think will win? What are your predictions? Feel free to let us know your views and thoughts. Share it with other readers too. Stay tuned to TheReporterTimes for latest FIFA CC 2017 news.